Target Hospitality: A Former SPAC IPO With Multiple Ways To Win — Mr. Bean reveals his latest deep value play, a SPAC IPO that focuses on providing temporary housing solutions for oil field workers. Investing In Shipping Stocks: Lessons From Walter Schloss — Mr. Bean shares the wisdom of Walter Schloss, a legendary value investor who compounded capital at 16.4% a year for 32 straight years. He then uses Schloss’s stock picking framework to dissect potential value in the shipping space. Minsky and the Levy/Kalecki Profit Equation — Alex answers the question “where do profits come from?” in his latest high level macro essay. In it he discusses the systematic issues that threaten the stability of the US economy. Macro Ops Podcast: The Global Macro Picture Is Read To Explode with Alex Barrow — Host Chris D. talks with Alex about the developing trends in the major macro markets. Our friend Kean Chan put out a great writeup on the horse-racing gambler who earned nearly a billion dollars over his betting career. Kean’s piece is based off a profile done by Bloomberg last year. I highly recommend you read both. Here’s Kean’s article and the one by Bloomberg. The gambler in question is Eric Benter, a Pittsburgh native who’s got to be a runner up for The Most Interesting Man in The World title. Benter spent his early years hitchhiking across Europe on down to Egypt and even driving across Russia at one point. At 22, after reading Edward Thorp’s Beat The Dealer, he dropped out of college and moved to Vegas where got a $3 an hour job clerking at 7-11 so he could count cards in his off time. He joined a blackjack team which ended up being so successful that they were chased out of town and blacklisted from Vegas casinos for life. From there, Benter and one of his card counting buddies, went to the race tracks in Hong Kong with the goal to do what most said was impossible, quantitatively crack horse betting. They did… And the two literally wrote the code that would form the base of a new budding industry, quantitative sports gambling. Give both pieces a read, you’ll be happy you did. Moving onto China. Dinny McMahon, who wrote one of my favorite recent books on the country titled China’s Great Wall of Debt, put out a solid writeup on the Macro Polo site where he discusses China’s NPL (non-performing loan) problem and what it’s doing to address it. It seems that China is operating on the economic principle that a “rolling loan gathers no loss”. The CCP is carrying out a multi-pronged approach of opacity (no one knows the true level of NPLs in the economy), passing the buck (spreading the bad assets amongst private and local governments), and then providing countervailing liquidity injections to keep the house of cards from cratering in on itself. And so far, it seems to be working as well as one could hope. It would be inaccurate to interpret an increase in the debt level as an abandonment of the deleveraging campaign. In fact, the very structure of the current stimulus speaks to Beijing’s commitment to cleaning up the financial system. Rather than a free-for-all, where banks and shadow banks are given the freedom to shovel as much credit as possible into the economy—which is broadly the approach to stimulus pursued repeatedly between 2009 and 2016—the current effort is targeted and limited only to banks (that have been chastened since their freewheeling days) and the bond market. The current effort to stimulate the economy has been designed specifically to avoid undoing the deleveraging of the last two years. …Unquestionably, Beijing’s long-term goal is to reduce—or at least stabilize—debt levels relative to the size of the economy. However, given that China’s economic model is still dependent upon debt-enabled investment to deliver politically acceptable levels of growth, such a reduction is not likely to be feasible in the short term. Hence, the great success of financial reform has been—rather counterintuitively—to make the system less risky so that it might safely support higher levels of debt, at least for the time being. If you’re interested in China — which, if you have money in the markets then you should be — this article is certainly worth a read. Here’s the link. 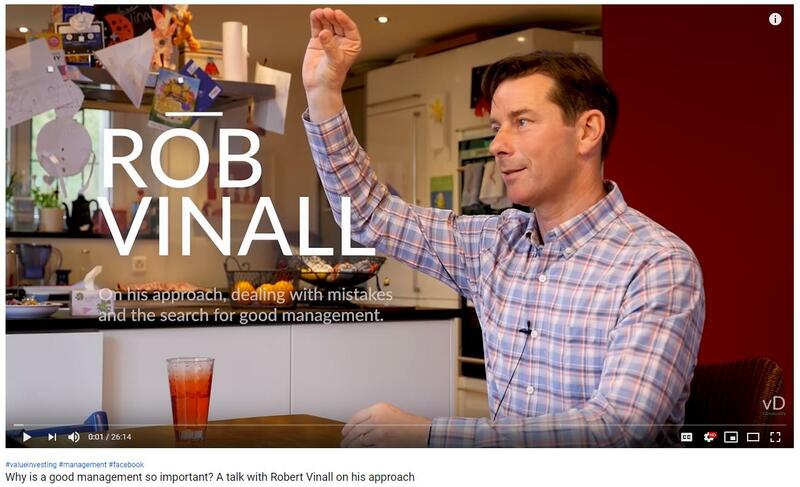 Check out this interview with Robert Vinall who’s the global value-focused fund manager of RV Capital. Robert has a great track record and in this interview gives some insight into his investment process and how he started his fund. It’s just 26 minutes long and worth a watch. And looks like they have a part 2 coming out soon. (Link here). @TN posted a good thread this week on the extremes in sentiment we’re seeing in the Chinese market (link here). @TN notes that according to a recent Bloomberg survey, Chinese fund managers are 74% allocated to stocks — the previous high was 80% reached in Jan 18’, right before a major market peak. Also, China’s margin debt has exploded and is now close to the heights reached in early 18’. 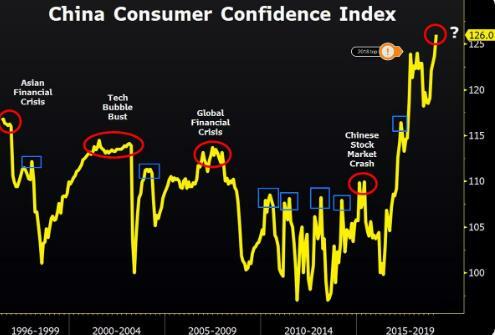 Here’s a chart showing Chinese Consumer Confidence going parabolic via @TaviCosta. Patrick O’Shaughnessy’s latest podcast with hedge fund manager Geoffrey Batt is stellar. Batt is one of the only US-based hedge funds focused on Iraqi equities. The episode is titled The Nature of Transformational Returns and Batt does a great job of laying out what one has to do to accomplish such. They cover a wide range of topics, from how the news often does not portray an accurate depiction of what’s really going on on the ground to the importance of raising money in a way that’s conducive to your market approach. Batt’s style of investing reminds me of how the Chandler brothers operated in their early days. Definitely give the episode a listen if ya get a chance. Here’s the link. To be honest, I’m mainly just biding my time until we see a break in the tightly coiled macro instruments we’ve been talking about (link here). That’s what’s most got my attention at the moment. Oh, well, that and shippers which have been breaking out (link to our write up here). But I’m also looking at emerging markets which are fairly overbought and may be in for a pinch if we see US rates continue to rise (wrote about that here). Take a look at Chinese tech company Tencent (TCEHY) below. Tencent has the largest weighting in the MSCI EM ETF (EEM). 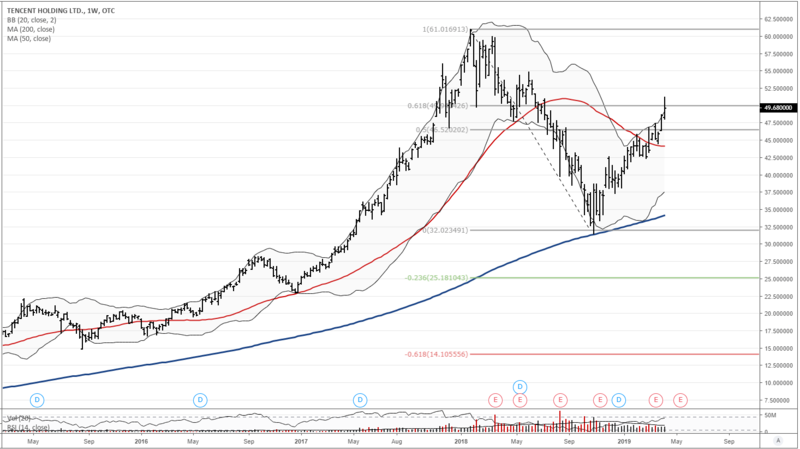 The chart is a weekly showing that Tencent has retraced up to the fib 0.618 level while piercing its weekly upper Bollinger Band. We’ll have to see if it has a weak close on the week. If so, it may be a good candidate for a tactical short. Also, check out EM high yield (EMHY). Unlike the US it’s gone nowhere since the start of the year. Could be a sign of exhausted buyers which would not bode well for EM stocks. Oh and also keep an eye on gold. It may be the tell. If it closes below the significant 1290 level then it’s likely headed much lower and EM should follow suit (and the dollar would move higher). Understand: the greatest generals, the most creative strategists, stand out not because they have more knowledge but because they are able, when necessary, to drop their preconceived notions and focus intensely on the present moment. That is how creativity is sparked and opportunities are seized. “Friction” in markets is a constant. Thus, we need to maintain a fluid mindset and not cling to rigid opinions or beliefs. We need to keep a child’s mind and remain open to new experiences and theories that contrast with our own. The continuous ability to adapt and evolve is necessary to one’s long-term survival in this game. Like Bruce Lee said, “become like water my friend”.